A fantastic long range goal by Lance Johnson was overshadowed by a 4-1 defeat for Louth Town Reserves at home to Skegness United on Saturday. The final score was harsh though and there were positives to take. The first 75 minutes were evenly contested and Town only conceded one goal after Lance Johnson was unlucky to hit a post. Unfortunately the players began to tire late on and conceded three goals in the last 15 minutes. Two of those goals were scored in quick succession before Johnson netted a brilliant strike. He let fly from 30-yards out and found the net. 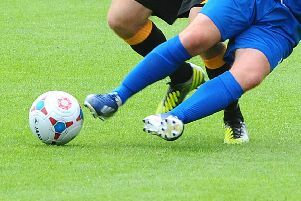 Afterwards Skegness added a fourth goal with seconds remaining to add gloss to the final score. Town played well for most of the game against the side that are top of the Lincs League. Louth’s Ben Humphrey was happy despite the result. He said: “We were only 1-0 down with about 15 minutes left and had played really well until then. “Unfortunately they added a couple more goals in a few minutes late on, but soon afterwards Lance Johnson pulled one back with a super goal from a long way out. Then they scored another right at the end which was a shame for us. Town are next in action on Saturday, December 20, away to Wyberton in the Lincs League (2pm). Town (4-4-2): B.Smith; Goy, Stainton, J.Marshall, B.Coulam; R.Smith, Reilly, Chapman, R.Johnson (Buck 28); D.Marshall, L.Johnson.